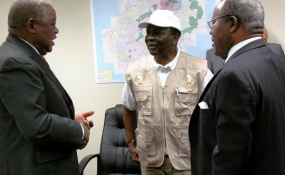 Among observers of the Lesotho elections were, from left, former heads of state Rupiah Banda of Zambia, Yakubu Gowon of Nigeria and Bakili Muluzi of Malawi. Cape Town — An opposition party led by a veteran Basotho politician who once served in the Cabinet of long-time Prime Minister Pakalitha Mosisili has made an unexpectedly strong showing in the country's elections. With results in three-quarters of the country's constituencies declared on Monday, Tom Thabane's All Basotho Convention (ABC), which broke away from the then ruling party in 2006, was running neck-and-neck with the Democratic Congress (DC), the current governing party. The ABC had 26 seats and the DC 25. The Lesotho Congress for Democracy (LCD), the party which ruled Lesotho until earlier this year when Mosisili left to form the DC amidst a leadership dispute, had only 12 seats. The Popular Front for Democracy had one. By midday on Monday, the Independent Electoral Commission (IEC) had announced the results in 64 of 80 constituencies. Analysts had predicted that the principal struggle would be between the DC and the LDC. The Lesotho news publisher, Public Eye Daily, reported Monday that news of Thabane's success sparked "wide celebrations" around the capital, Maseru. But a lunchtime electoral commission statement that further results would not be announced until Tuesday caused consternation at the election centre in Maseru. "The IEC announcement has enraged partysupporters, who have vowed not to leave... until all the results are made public today," Public Eye reported. Tom Thabane was a civil servant under Lesotho's first post-independence prime minister, Leabua Jonathan, then went on to serve both the military regime that ousted Jonathan and later the Basotholand Congress Party, which had been suppressed under Jonathan. He was a member of Mosisili's cabinet between 1998 and 2006.